The hotel may be still asleep, but by six o’clock a Scottish May morning is already in full swing. 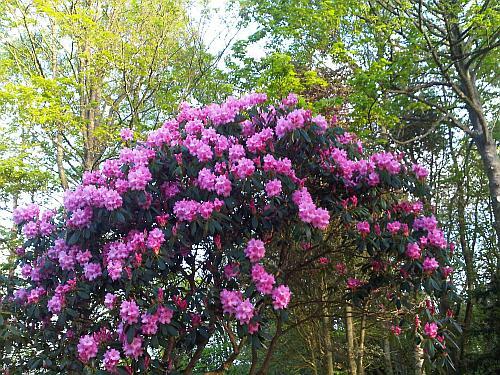 Outside the sky is clear and blue, the lawns still dew-swept and the rhododendron in full flower. At the end of the driveway, I turn right, and set course hard along the kerb. Any Aberdonian knows that the lethally fast South Deeside road is no place to play in traffic, but for now it’s quiet and a gentle mile is all I need. A few minutes go by as I ponder the wonders of travel and the rewards of rising early. A long day in meeting rooms will pass more swiftly with an hour of energy spent before the taxi calls to find me. 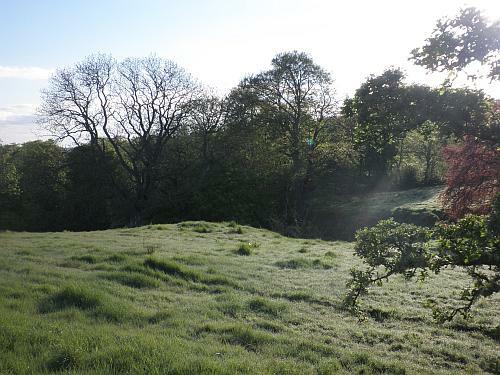 On the other side of the road, the trees are opening up a longer view, and I step gingerly across the highway to take in the morning glory of the River Dee and the open farmland stretching far beyond. 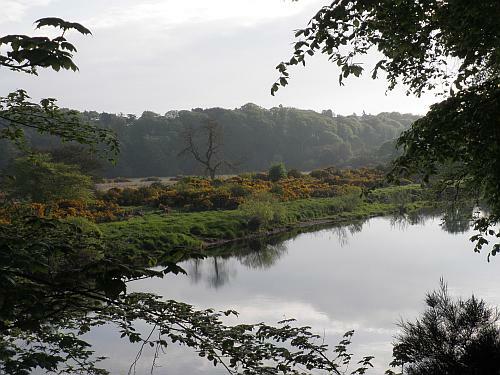 The river is tranquil here, in the later reaches of its 87-mile journey from the Cairngorm Mountains to reach the sea at Footdee beside Aberdeen harbour. The Celts worshipped the Dee as a goddess, and today she is blessed with diverse riches. Upstream from here lie some of the most scenic salmon fishing grounds in Britain, whilst downstream the waters flow into the busiest oil port in Europe. This peaceful view alone has more than repaid my early alarm call, but the fast cars won’t be long in coming, and so I hit the road again and gratefully turn right, uphill and full on into the face of rural Aberdeenshire. 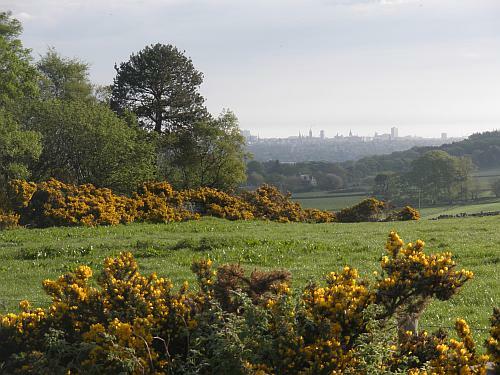 The slope ahead is rising uncomfortably now, demanding fuller effort and concentration, but eventually I look back on a perfect vista of green hills and yellow gorse, with the tower blocks on Aberdeen’s Anderson Drive floating faintly in the distance. Here I am, just five miles from Scotland’s third city, and the rural idyll is still, unbroken. 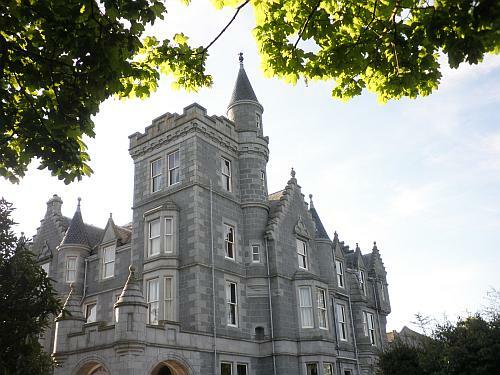 A friend of mine lives nearby, and as I pass his house on this splendid springtime morning, a small and unexpected flutter of regret flickers across my mind, for these unappreciated gifts of the Aberdeen lifetime I never made my own. A few reflective thoughts are enough to distract me from one final breathless rise ahead, and then I turn gratefully back downhill to greet my day ahead. 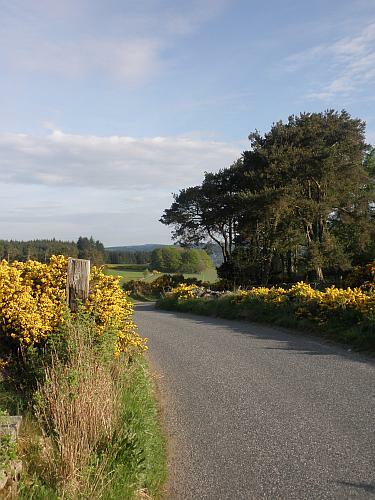 Blue sky, gorse, long grass and easy strides will bring me to the South Deeside Road for a final mile now frautly shared with SUV commuters speeding to the Granite City. Before long I’ll join them, but in place of their white-knuckled weary tension, I’ll trade a morning’s clarity of thought and fresh Scottish calm within my mind. The granite mass of Ardoe House stands firm and fortress-like ahead of me amidst the gardens. And as my day begins, I’ve already seen Aberdeen from a different place this morning. 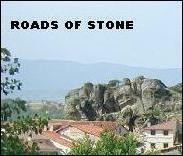 This entry was posted in 2011, life and times, Scotland, summer, travel. Bookmark the permalink.